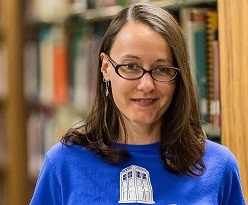 This week on the Filament Games Podcast, Dr. Krista-Lee Malone joins us to discuss her work in Taiwan on a language learning MMORPG and her new research on gender and tabletop RPGs. We also revisit our discussion about modified cats and turn the tables in Fact or Fabrication. Dr. Krista-Lee Malone is a lecturer in Sociocultural Anthropology at both the University of Wisconsin-Milwaukee and Ripon. Her research includes studies on raiding guilds in World of Warcraft, the making of educational games in Taiwan, and gender issues in playing and live-streaming tabletop RPGs. While in Taiwan she also worked as a cultural consultant (read: writer, editor, voice-actor, translator, curriculum developer, and American expert) for UrIsland, the makers of the game 紐約說話島 (Talking Island). While not gaming she branches out into other realms of geekdom and occasionally teaches an upper-level class at UWM on geek subcultures.